Working as a software engineer has been Mohamed’s goal since he began his studies back in 2004. His position at Brainlab gives him the satisfaction of knowing that he is helping to create technology that will save patients’ lives. 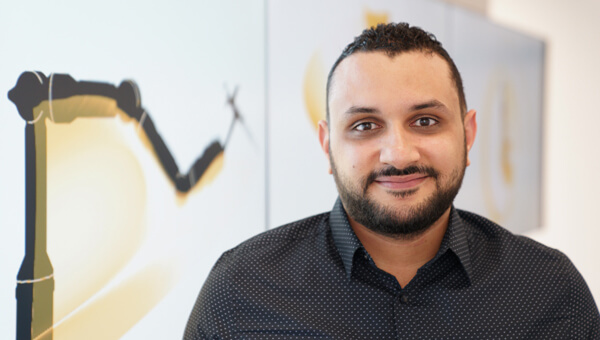 Read more about Mohamed’s career journey below! I studied Systems and Biomedical Engineering at Cairo University from 2004 to 2009. There were very interesting topics, ranging from Medical Equipment and Electronics, through Software Engineering, all the way to Physiology and Biology. And what’s your professional background? My career has been 100% dedicated to the software aspects of the healthcare field. I have assumed the role of a team lead in various projects, mainly focused on 3D imaging and healthcare management systems. My native language is Arabic, of course. I also speak fluent English and some German. How does your department contribute to Brainlab? The Robotics department is a fairly new department at Brainlab. Our efforts are focused on making a strong impression for Brainlab as we enter the robotics market. Therefore, the work the Robotics department does is tremendously essential for determining our position in that market. What inspired you to go into the medical software field? My first job as a fresh graduate was for a giant manufacturer of medical equipment. Part of my job was to attend surgeries to observe our highly sophisticated equipment in action. During this period of my career, I realized how crucial the software is for the whole thing to work. And I witnessed firsthand that no matter how well a piece of equipment is designed, the software can really make the difference in saving a human being’s life. I always wanted to be a superhero. Becoming an engineer was my plan B. What was your first impression of Brainlab? From the very first moment, Brainlab struck me as professional, organized and extremely efficient. I found it amazing how smoothly the interview and the hiring process went. Although everyone was being extremely nice and friendly, it was obvious that the hiring process is precisely defined. I was fascinated by how the company was very keen on really knowing the person being hired, how thorough the interviews were, and how everyone managed to conduct business in a very professional, yet very graceful manner. Moreover, the following months proved my first impression accurate. My colleagues at Brainlab went to great lengths to make sure I got oriented properly through various courses and knowledge transfers. What was one of your most memorable moments at Brainlab? My most memorable moment is definitely when the Robotics team officially released a piece of software developed by me. That was my biggest personal accomplishment since I joined Brainlab. Where do you see Brainlab making the biggest difference in healthcare? Brainlab is not only consistently introducing innovative solutions, but it is always keen to host symposiums as well. Doctors and clinicians from around the world come to share knowledge and discuss opportunities to contribute to the healthcare field. What three words would you use to describe Brainlab?